Electromagnetic Fields are a part of our modern daily lives. This is caused by the artificial current (AC) that surrounds us every day. Magnetic Fields are more common in the home than electrical currents. Any plug or wire carrying a current produces an electromagnetic field. This AC is different from the Earth’s current and the current it produces causes adverse effects in our bodies at a cellular level. There are 2 health concerns about EMF poisoning... magnetic polarity and radiation. First, a brief synapsis about magnetic polarity. (keep in mind, electricity is produced by magnetic fields) BASICALLY, as the current alternates direction, it also alternates the POLARITY from negative to positive. Within our bodies, healthy cells carry a negative charge. When a cell becomes sick or damaged, it changes polarity to positive. The more positively charged cells in our bodies, the more chance for illnesses to develop. By sitting near AC current fields, we are constantly, unendingly bombarded with positive polarity bursts, which begins to reverse the polarity of our healthy negatively charged cells and changes them into positively charged sick cells! For more detail on this discussion, you should read Peter Kulish's, "CONQUERING PAIN, The Art of Healing with BioMagnetism". For more on magnet therapy, how it works, etc.. see here. Second, a word about radiation. 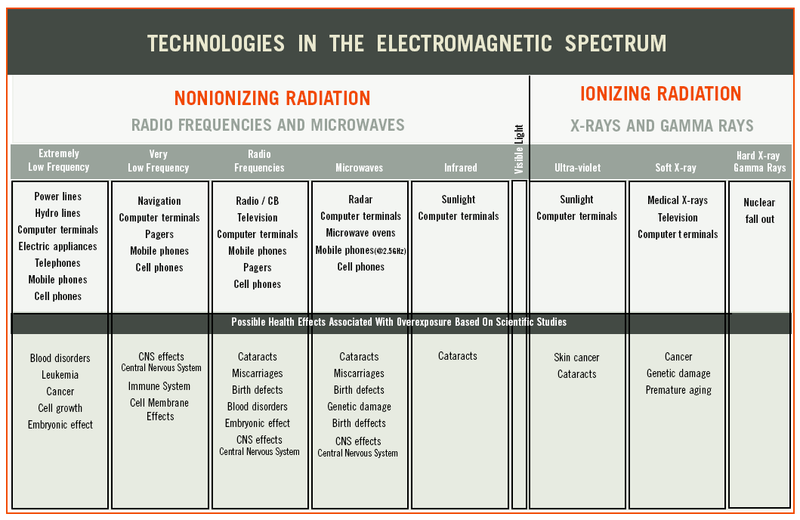 Electromagnetic radiation can be classified into two types: ionizing radiation and non-ionizing radiation, based on its capability of ionizing atoms and breaking chemical bonds. Anything that is electrical is a potential generator of EMF radiation. Some of the worse offenders are: computers, T.V., stereos, clocks, electric blankets, hair dryers, electric ranges, microwaves, fans, heaters, any electric motor, appliances, cell towers, power lines, florescent lights, etc. (Incandescent lights are o.k.) but telephones or cellular phones are not. The human body is designed with very specific EMF frequencies that regulate everything from our very 3D existence the various systems and cells in the bodies. Healthy tissue has these strong natural frequencies, unhealthy or diseased tissue has weak or "lowered" (different) frequencies. Will exposure to any one of these kill you? No. At least not immediately! Electromagnetic Hypersensitivity (EHS), also known as electro-magnetic sensitivity and electro-hypersensitivity, occurs when the amount of EMF radiation exceeds the body’s ability to deal with it. Everyone has an imaginary (but very real) ‘lifetime radiation cup’. The body can only tolerate a certain amount of electromagnetic radiation. Once that cup is full, because of many small deposits of EMF exposure... or even one very large dose, any exposure can be physically felt and is usually causing or contributing to end result illnesses. The body was not designed to thrive in the constant presence of electric, magnetic, wireless/rf or ionizing radiation as many of us are dong today. EMF protection is a necessity! The following list represents diseases and health problems that are either a direct result of electromagnetic radiation poisoning or are closely associated with it. Keep in mind that all health issues can be affected to some degree by exposure to EMF radiation, whether electric, magnetic, wireless or ionizing radiation, since it weakens the immune system, stresses the body and damages healthy cells. Though every person’s cells are affected by electromagnetic radiation, each is affected at different ‘speeds’. Here are some of the factors that encourage a faster or stronger reaction to EMF exposures. The electromagnetic (EM) spectrum is the scientific name for types of photon radiation. Electromagnetic radiation consists of photons (light particles) that travel in a wave-like pattern at the speed of light. The amount of energy found in these photons forms the various types of electromagnetic radiation in the spectrum, which is expressed in terms of energy, wavelength or frequency. Frequency is measured in cycles per second (hertz), wavelength is measured in meters, and energy is measured in electron volts. The strength of an EMF depends on its wavelength and frequency. More waves with shorter wavelengths create more energy as you move up the spectrum. What Is the Range of Wavelength of Electromagnetic Waves? 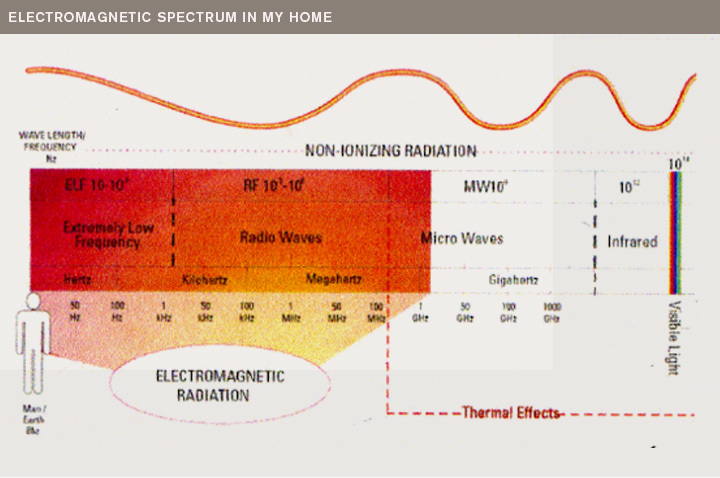 At the low end of the electromagnetic spectrum are extremely low-frequency (ELF) waves. These have longer wavelengths and come from the 50- to 60-hertz power lines that feed household appliances. They can pose health risks, especially when they are close to the body for extended periods. On the high end is radio frequency (RF) radiation. 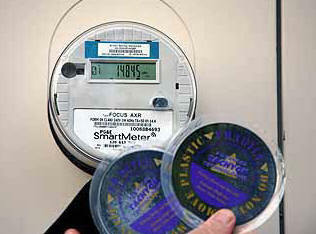 This comes from cell phones, cordless phones, mobile antennas, broadcast towers, electrical security systems and more. The higher the frequency, the greater the risk to health. For example, microwaves are very-high-frequency radiation, and they can pose a significant health risk. Many cell phone towers operate in the microwave range. For many young women today, tucking cell phones in the bra has become a cool, hip way to have easy access to these electronic devices. Women can jog, drive, shop or sit in darkened movie theaters, quickly responding to tingly vibrations at their breast. Most women have no idea that cellphones are two-way microwave radios that should not be kept directly on the body. “As we broach the October reminder of breast cancer awareness, the media are packed with warnings about the disease. What’s missing from this welcomed public attention is the fact the ways some people are using their phones today increases their risk of developing breast cancer and other diseases. A cell phone’s sporadic microwave radiation seeps directly into soft fatty tissue of the breast. That’s not a good thing,” warns EHT’s founder Dr. Devra Davis, cancer epidemiologist and veteran breast cancer researcher. Adding credence to the our concerns regarding a link between cell phones and multifocal breast cancer is a new report in Case Reports in Medicine, highlighting four young women—ages from 21 to 39—with multifocal invasive breast cancer. This scientific paper raises concern of a possible association with nonionizing radiation of electromagnetic field emissions from cellphones. The research team, which included Dr. Lisa Bailey who is a former president of the American Cancer Society California and one of California’s top breast surgeons, Dr. Robert Nagourney of Rational Therapeutics one of California’s top oncologists and Dr. John West from Breastlink, uncovered a common theme from each of the four patients studied. Dr. Devra Lee Davis, M.P.H., Ph.D, is recognized internationally for her work on environmental health and disease prevention. A Presidential appointee that received bi-partisan Senate confirmation, Dr. Davis was the Founding Director of the world’s first Center for Environmental Oncology and currently serves as President of Environmental Health Trust, a nonprofit devoted to researching and controlling avoidable environmental health threats. National book award finalist, for When Smoke Ran Like Water, 2002, she lectures at universities in the U.S. and Europe and was the recent winner of the Carnegie Science Medal in 2010 and the Lifetime Achievement Award from Green America in 2012. Her 2007 book, The Secret History of the War on Cancer, details the ways that public relations strategies have undermined public health, and is being used at major schools of public health, including Harvard, Emory, and Tulane University. Her recent book, Disconnect: The Truth about Cell Phone Radiation and Your Health, what the Industry has Done to Hide it, and What You Can Do to Protect your Family, Line was published in the U.S. Emerging evidence is raising significant questions about health risks from cell phone and wireless radiation. Given the size of the potential impact, there is inadequate awareness, research, and regulation. In 2011, the W.H.O IARC spent a year reviewing experiments and heath studies and concluded that cell and cordless phone radiation was a “possible human carcinogen.” This is the same category as lead, DDT and engine exhaust – compounds that are subject to serious regulation and control today. This new article reviews new studies published since the W.H.O review and concludes that this radiation should be re-classified as a probable human carcinogen. Impressive reports that have studied those who began using cell phones before age 20 find a 4 to 8 fold increase in brain cancer as well as increases in leukemia. In addition important new study found that cell phones do produce hot spots in living brain tissue, contrary to the assumption used to set all standards today. Finally, this report documents the growing shortage in oncology services yet to come. OK, what do I do to protect myself from EMF Poisoniong? You'll find various products and methods on the internet using different methods. 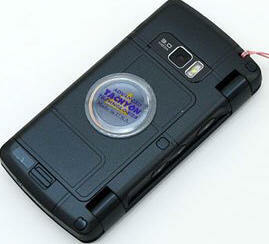 Two of our favorite ways to PREVENT and REVERSE the damages of EMF poisoning are with magnets and Tachyon Fields. Tachyon fields are a great way to PREVENT EMF poisoning. 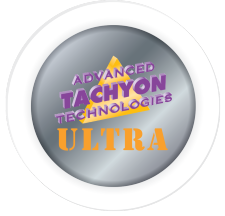 The Tachyonized Silica Disk is an effective tool to completely eliminate the detrimental effects of electrical devices. Biofield analysis indicates that the Tachyonized Silica Disk eliminates the detrimental effect of electromagnetic fields on humans. Properly placed negative magnetic fields are a great way to help REVERSE the damages already caused by EMF poisoning. (and many other illnesses caused by non EMF related issues) The Advanced Magnet Therapy Kit has helped people all over the world to overcome serious health conditions and maintain good health. It is a complete package of very powerful Rare Earth BioMagnets, so that all the advanced therapies developed by The Foundation for Magnetic Science can be employed by anyone. Magnet Therapy Protocols for over 170 conditions without side effects! 1. Interview with Dr. Eckel was published by Schwabischen Post 12-07-06. Find this interview at www.heseproject.org. See "The Cell Nucleus is Mutating." 2. "Neurological Effects of Radiofrequency Electromagnetic Radiation," a paper presented by Dr. Lai to the Mobile Phones and Health Symposium, October 25-28, 1998, University of Vienna. Also "DNA Damage and Cell Phone Radiation," www.rfsafe.com, 11-02-05. 4. "Mobile Telecommunications and Health"Summary of the ECOLOG study for T-Mobile, 2000," Find this summary at www.hese-project.org. 8. "Health Social Services and Housing Sub-Panel Telephone Mast Review," a public discussion by Dr. George Carlo, 2-26-07. Find this excellent dissertation at www. safewireless.org. 15. See <http://www.c-a-r-e.org/>www.c-a-r-e.org for information about groups affected by Lookout Mountain broadcast antennas. 17. Quote from letter by Norbert Hankin, chief environmental scientist with EPA's Radiation Protection Division. This letter was received by EMR Network 7-16-02 and can be found at www.emrnetwork.org. 18. "Supreme Court Rebuffs Challenge to U.S. Tower Policy," Microwave News, Jan./Feb 2001; also EMR Network Petition For Inquiry To Consider Amendment of Parts 1 and 2 of the FCC's Rules Concerning the Environmental Effects of Radiofrequency Radiation, September 25, 2001. See also FCC order to deny application for review filed by the EMR Network, adopted July 28, 2003. These documents found at www.emrnetwork.org. 21. Practical Guidelines to Protect Human Health Against Electromagnetic Radiation Emitted in Mobile Telephony, Summary June 2001, Miguel Muntane Condeminas, industrial engineer for Consulting Comunicacio i Disseny S.L, Barcelona, <mailto:m.co-di@eic.ictnet.es>m.co-di@eic.ictnet.es. See Section 4.3.1 "US Embassy in Moscow Study." 22. See www.health-concerns.org and <http://www.safewireless.org/>www.safewireless.org. These sites provide a pathway to access Dr. Carlo's Mobil Telephone Health Concerns Registry where people can report ill health effects from living near microwave transmitters or from the use of wireless devices. 36. "How WiMAX Works," E. Grabianowski and M. Brain, www.computer.howstuffworks.com. Statements contained on these pages about EMF poisoning, alternative medicine, or any other topics have not been evaluated by the Food and Drug Administration. The information found here is not intended to diagnose, treat, cure, or prevent any disease. Suggestions and ideas presented in this document are for information only and should not be interpreted as medical advice, meant for diagnosing illness, or for prescriptive purposes. EMF Poisoning... a slow killer!